Preserve Nature – Save Honey Bees! Posted in Uncategorized | Comments Off on Preserve Nature – Save Honey Bees! Did you know? “If beeswax is accidentally spilled on a wooden surface, take off as much as possible, then heat the area using a hair dryer on a low setting. Once the wax liquefies, wipe clean with a dry cloth.” (Fleetwood p.64, 2009) Learn About Honey from Saudi Arabia HERE We save bees specializes in saving bees and educating people about bees. 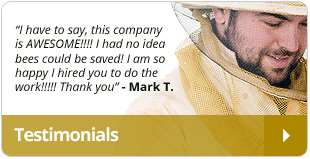 We Save Bees can solve your bee problems….